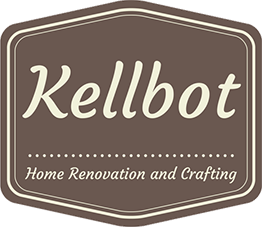 Our New Home To-Do List - Kellbot! | Kellbot! Our new house may not have a bed, but it has internet! It took us all of 10 minutes in the new place to realize that we weren’t going to survive long without it. The first thing we did in our new home was to make a list of all the things we needed (or just wanted) to do to make it move-in ready. Some of them were quick tasks, like reprogramming the garage door (omg we have a garage! ), but there are some big projects as well. After a week long ordeal with Comcast that gained me more than a few new grey hairs, we finally got broadband internet set up. After two days of scrubbing and vacuuming, we finally got the house to a point where it felt clean enough to be ours. We purchased a few inexpensive counter stools from Target so we’d have somewhere to sit. Once the holidays are over we’ll tackle some of the bigger items on the to-do list. Painting is one of the biggest and most daunting tasks. In addition to the pretty pretty princess closet, the whole house could use a fresh coat of paint. 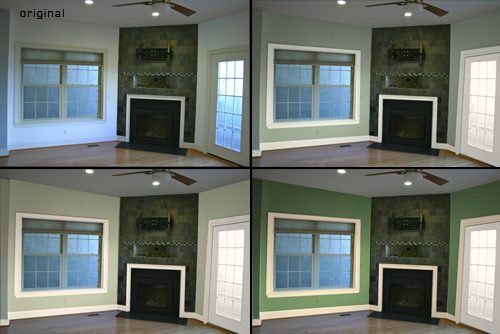 I’ve been using the Sherwin Williams paint visualizer to try out different color schemes on a photo of the living room fireplace (omg we have a fireplace!). 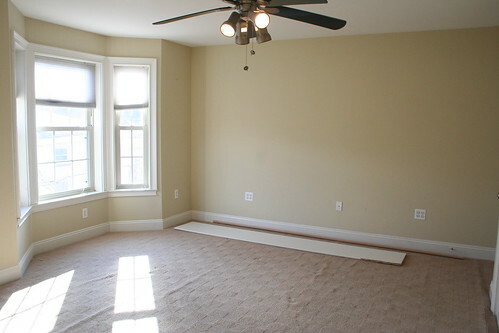 Of course, the color paint we pick out will be heavily influenced by the floors, which also need work. The house currently has some unappealing carpeting in the bedrooms. We’d like to replace it with hardwood (or something similar looking), which is a giant project in and of itself. So many choices… bamboo? solid wood? engineered wood? No matter what though, the carpet has got to go. And then there’s the bar. The previous owner installed a wet bar in the den, which is a little odd to me because the den is attached to the kitchen. The kitchen has a perfectly lovely island with a bar seating area, so why one would want a separate bar 20 feet away is a mystery to me. Also, only the hot water appears to be plumbed into the faucet. Overall it’s a strange little corner. 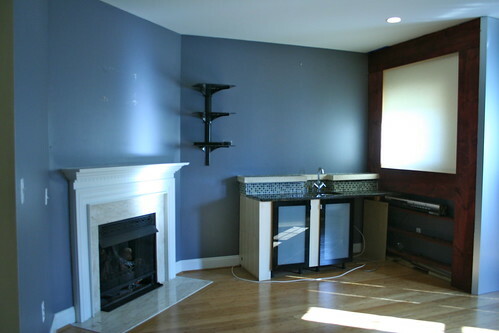 But most of all we’ve got that wall earmarked for the TV, so the bar will be removed. We’ll have to have a plumber in to close off the water lines. Oh, and of course we need to have the house wired for ethernet so we can set up our NOC in the basement. Because no home is complete without a central media server and a computer attached to every TV. There are a dozen smaller projects, like an electrical junction box that emits a terrifying buzzing sound and a window that looks like it may have some water damage. Thankfully the floors and walls are the only things that really have to be addressed before we can move in. It’s exciting and overwhelming at the same time, and the more we work on it the more it starts to feel like home. OMG Kelly! I had no idea all of this wonderfullness was going on for you guys! Congrats on the new house. I’m soo jealous of that kitchen! Thanks! I’m super excited, if not completely overwhelmed/intimidated. It’s a lot of house for two people, but the plan is to grow into it.